1. Adjustable – As your baby grows, you will want to be able to move it up to give baby room to stretch and move. Some cushions have holes at different heights so that it can be moved as baby grows. If it is too tight, it may restrict movement and be uncomfortable. 2. Removable – This is important for two reasons. First, you’ll want to be able to wash it as baby drools or spills on it. Secondly, baby will outgrow it in a few months but may still fit in the car seat. This enables you to get a longer use out of the car seat. 3. 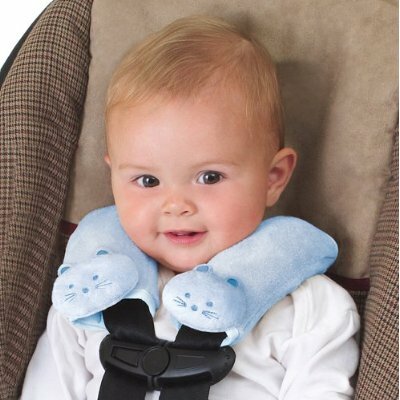 Secure Fit – In order to provide proper head and neck support, it will need to be securely attached to the seat and made of a firm enough structure and padding to be effective. 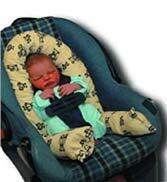 People additionally look for car seat cushions to add warmth for babies in a cold climate. This can be effective rather than layering baby up in coats and clothing layers. Whether you use a wool cover, fleece or go for more of a boot style that covers the entire seat for warmth, these can be great options to keep baby cozy and healthy through the winter season. Finally, many moms choose to add an extra pad to save up on clean up tasks. A leaky diaper can easily be changed, but taking apart the straps and covers to wash the car seat is a lot of work. Just figuring out how to put it all back together can take hours. 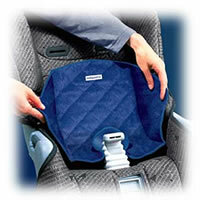 A piddle pad or other protection added to the seat can give baby an extra cushion and mom the convenience of quick clean up.